Now I know I said I would be good, but after a whole week of being good...actually two weeks minus one day of "being good". I couldn't help myself when I stopped for gas heading into town to see the husband. 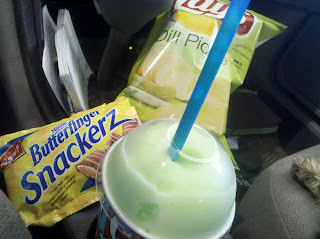 I had to buy dill pickle chips, a cherry limeade Icee, and (I now regret) Butterfinger Snackers. I say regret because the Snackers were gross. They tasted like the cheapest chocolate you could ever find on a oyster cracker. It tasted nothing like a Butterfinger. Waste of money (calories). I then spent the next 30 miles telling that dog paw you see to stay away from my Icee. I then got to my parents house to find out my Mom was making tacos...on white flour totillas. I managed to stray away from the tortilla and instead made a taco salad. Looks like weekends are when the meat eating will occur. I plan to make a giant pot of veggie soup for next week, and I need it after this mess. I woke up this AM craving fruit. 1. If my house was on fire and I could only grab 3 things I would grab my antique Lincoln rocking chair, my laptop, and my wedding album . 2. A smell I really like is I know this sounds weird, but new car or new plastic. I love the way it smells to open a brand new shower curtain. .
3. Something you might not know about me is I hate math with a passion. If I were told I'd have to teach math I would probably quit my job. My students try to get me to help them with homework some times...I'll do ELA all day long, but I'd rather have my toes burnt off then do any sort of math . 4. Some of my favorite websites to putter about on are Etsy, Amazon, almost all the blogs I follow, Facebook and Twitter, and last but not least Teach Louisiana. I am in the midst of finding a job so when I move to South Louisiana I am not freaking out wondering if I will have one . 5. This weekend I will hanging out with Jeremy at my parents house, being lazy, doing homework, and celebrating Pop's birthday with some steaks and cake . 6. Nothing makes me happier than having nothing to do, no homework, trying a new recipe, shopping for clothes . 7. A bad habit I have is biting my nails when I am anxious. I also have developed a bad habitat of having a bad attitude about my job lately. Hopefully the job part changes when I get to move. I just can't take constant negative .